The true taste of Scotland. 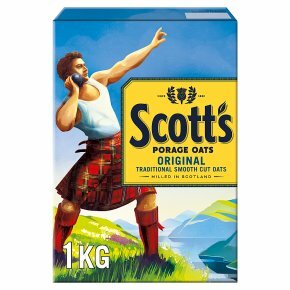 Tasty tips... For a slightly sweeter taste, stir in a tablespoon of golden syrup to your warm bowl of Scott's Porage Oats. Delicious! Please be careful with hot product. Traditional cooking...Simply mix 40g of Oats with 275ml of milk (or cold water) in a saucepan and bring to the boil. Simmer for 6 minutes, stirring occasionally. Serve with sugar or salt to taste. Enjoy!